PREMIER CHAUFFEURED TRANSPORTATION is owned and operated by 2 seasoned veterans with over 30 years of combined black car/limousine experience. We are passionate about providing a unique, quality event for our clientele by utilizing everything we've learned since entering the industry, things that are as important to us as they are to you. Such as professionalism, knowledge of the city or route, a clean vehicle that is well-maintained and smells fantastic, safety and having a great understanding of our customers' needs and demands. Contact us today for your business or leisure event when you are looking for a limousine, luxury sedan or premium SUV for your transportation needs. 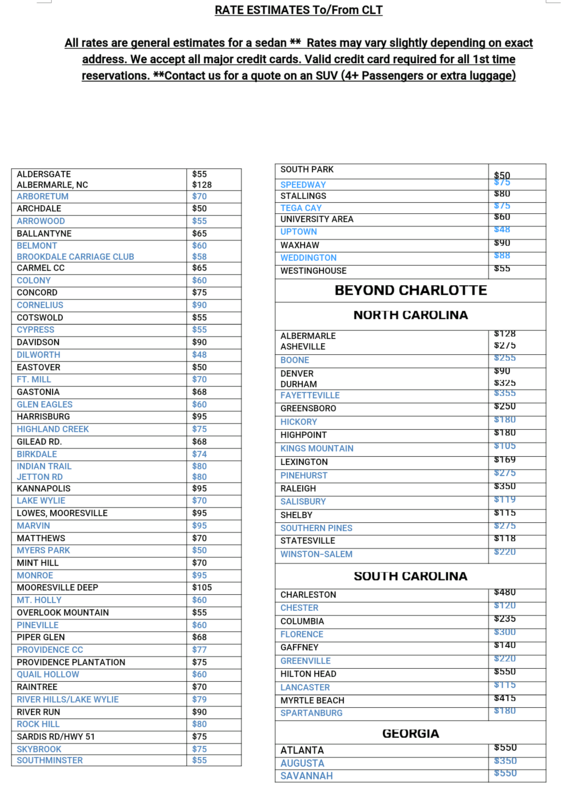 PREMIER provides transportation services in Charlotte, NC and surrounding areas. We service the Charlotte airport (CLT) and many surrounding airports including ATL, GSP, PTI, CAE and all private airports. You tell us where you'd like to go and we'll take you there safely and in style! You are number ONE!! Make us your choice for ground transportation. PREMIER CHAUFFEURED TRANSPORTATION prides itself on providing top notch customer service, so you can count on our friendly and professional staff to get you where you are going in a safe and timely manner. Every driver has passed a Federal background check and each vehicle and driver is fully commercially insured and permitted by the Passenger Vehicle for Hire (PVH) office. We only hire experienced drivers. Our customers are our main priority. Count on PREMIER for your special event! We want to take you to your destination in style, which is why we offer a fleet of clean, late model vehicles for you to enjoy including sedans, limos and SUVs to take you to or from the airport or your special event. Your safety is a priority - we make sure our drivers are highly trained and our vehicles are always up to date and reliable. Our goal is for you to be able to kick back and enjoy the ride while we take care of the rest! We've been in the business since 1996 and have seen numerous changes. The primary catalyst has been the birth of ride sharing. Ride sharing hasn't only changed the way people buy or rent cars, obviously it's also changed chauffeured transportation...this includes taxi cabs as well as black car service. WHO ARE YOU REALLY RIDING WITH? With the emergence of ride share applications cabs are endangered. This is due to the initial excitement of ride share applications available on the market. I, along with most seasoned travelers rarely consider calling a cab anymore. This has actually impacted the black car industry further because cab drivers are now moving to black cars and ride sharing to make a living. Nothing against cab drivers, we all have to support ourselves and our families however, this has watered down the product of ride sharing and in some cases, black cars. Essentially, you are quite often riding with a ride share or black car company with cab driver service. Beyond that, there's the "randomness" of the variety of vehicles and drivers that ride sharing companies provide. Quite honestly your ride share driver might just very well be a part time landscaper or hotel concierge or even a bartender but NOT a chauffeur. COME BACK TO QUALITY AND RELIABILITY. This is the reason people are now migrating back to the dependability and formality of black car services. With drivers who are professionally trained, licensed and insured, black car companies provide solid customer service and driving etiquette which is why all the aforementioned factors make what we have to offer unique and valuable in the evolution of the way we choose our ground transportation. Our rates are competitive and reasonable and although some competitors may offer a cheaper rate, they may also be offering those rates at the expense of quality and safety. Do not pay black car rates for a cab ride, your paid ride should be more than that! It should be reasonably priced as well as pleasant, relaxing and safe! 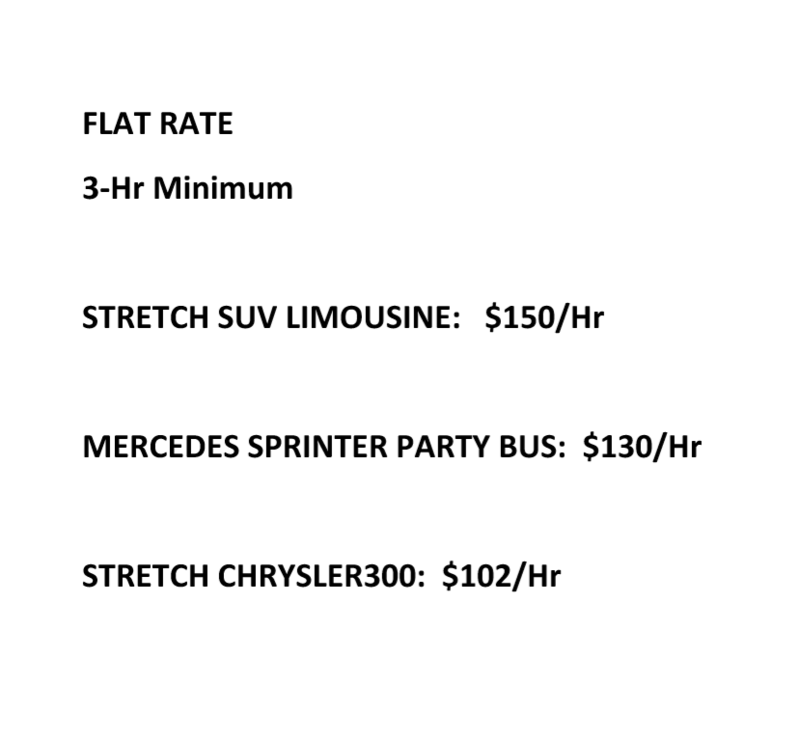 Contact us for the best rates on a limousine, sedan or SUV. Our car service is locally owned and operated and we promise 100% satisfaction. Just give us a try! Take your time, look around, and learn all there is to know about us. We hope you enjoy our site and contact us soon to make us your choice for transportation for your special night or to/from the airport. ALL RATES ARE GENERAL ESTIMATES FOR A SEDAN*. RATES MAY VARY SLIGHTLY DEPENDING ON EXACT ADDRESS. WE ACCEPT ALL MAJOR CREDIT CARDS. VALID CC REQUIRED FOR ALL 1ST TIME RESERVATIONS. Sign up to hear from us about specials, promotions and events. No space at end of email address please.